The following was originally published on Exclaim.ca. This is part one of my interview with She & Him, stay tuned for the second half! Volume Two, the sophomore release for American pop duo She & Him, touches on points that the first instalment didn’t get to reach towards, according to the male half, M. Ward. Ward said that vocalist Deschanel allowed for more emotions to be in this album, but with them came more mood swings. Though there are these new elements, everything else about the duo has pretty much stayed the same. For instance, they made both albums in a specific formula. The Los Angeles-based Deschanel and Portland-based Ward took about a year to make their follow up to Volume One in spurts of four to five days at a time. Deschanel wrote and recorded demos at her home and then emailed them to Ward. He then would make the arrangements before they would meet in a studio in either city. This time around, they were even able to make the song “Sing” work for Volume Two, after Ward wasn’t satisfied enough with the production for it to go on Volume One. Included among Volume Two‘s 13 tracks are two covers: “Riding in My Car” by NRBQ and “Gonna Get Along Without You Now” by Skeeter Davis. The duo recruited band Tilly and the Wall for their first single, “In the Sun,” as well as Jason Schwartzman to play bass on “Lingering Still” and Scott MacPherson and Mike Coykendall for the album’s rhythm section. For some of their tour dates, they have recruited Los Angeles-based musicians the Chapin Sisters as backup singers and occasional opening band. Volume Two will be released by Merge Records on Tuesday (March 23), and at midnight EST tonight (March 22), it will begin streaming here all week on Exclaim.ca. 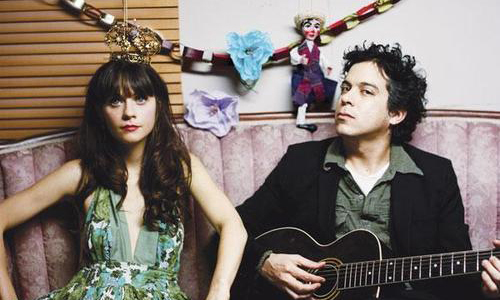 She & Him currently only have one Canadian stop: Toronto on June 9 at the Phoenix Concert Theatre. You can see all the band’s tour dates here. This entry was posted in Uncategorized and tagged Breaking News, Exclaim Magazine, Interview, Journalism, Music, New Releases, News, Promotion, Recommendation, Upcoming Albums, Upcoming concerts by Jessica Lewis. Bookmark the permalink. whooo hooo The Chapin Sisters are amazing! My Name is Hellen, Delightful to foregather you all !